Has Arzani earned a start against France? "The deeper they drop, the less space there is," Warren Joyce said, on the complexion of Melbourne City's 1-1 draw with Melbourne Victory on Saturday. "We talked about playing quicker, and the penalty comes from slotting the ball down the side for Jamie Maclaren. "The deeper they get ... you know, they've got big defenders, so it doesn't really matter." Football is not about tactics specifically, but the human emotion and interpretation of the game that shapes them, both in the moment and in preparation. On the surface, Joyce's observation in the post-match news conference could seem minor, but it's almost epiphanic in assessment. It's also what makes Bruno Fornaroli's departure from City on Tuesday by mutual termination of his contract so, in a word, understandable. 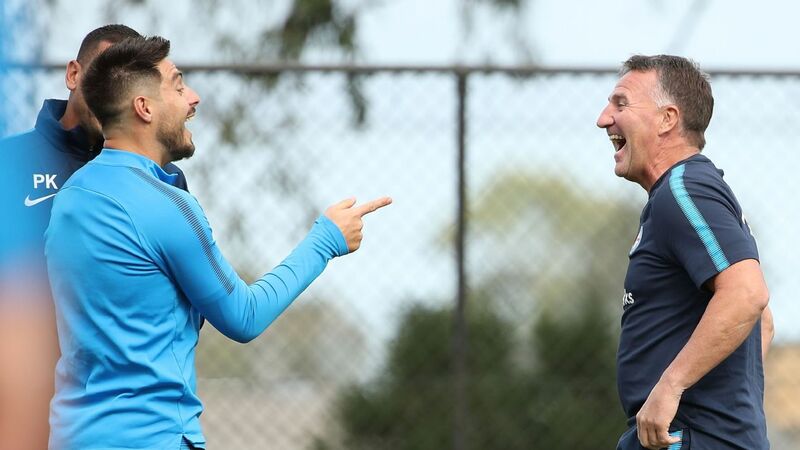 Going by reports, Fornaroli would now be free to train with Perth Glory -- the team City face on Sunday afternoon in a Borgesian event of cosmic symmetry. If the team's play was not reflective enough, everything about Melbourne City under Joyce becomes clearer in four small words, realised or not. Everything. Fornaroli's banishment and eventual exit is another scenario in an ever-growing list of decisions from the embattled Joyce, reflecting his own conceptual framing of football. For better or worse, Joyce's planning since taking over from Michael Valkanis has been built on a defensive base. It was evident from the outset, selecting what were essentially four centre-backs in his starting XI at the start of the 2017-18 season, with Michael Jakobsen and Osama Malik playing in midfield to provide protection for Iacopo La Rocca and Bart Schenkeveld. Luke Brattan initially found minutes on the right flank, before La Rocca's injury and suspensions to Jakobsen and Malik necessitated a shift to deep in central midfield. Meanwhile, the team's best individual talent in Daniel Arzani saw 79 out of a possible 1,260 minutes, before receiving his first start against Perth Glory and going on to carry the team's attacking burden. Within three starts, Arzani had already accounted for 17.3 percent of the team's successful dribbles for the season to that point. Nathaniel Atkinson (2.02) was the only player to have a per 90 minute rate in multiple figures, in comparison to Arzani's 8.33. The latter figure would grow to 12.12 by the end of the season. Playing Ritchie De Laet and Lachie Wales as makeshift strikers while Fornaroli remained out of the squad was a mere continuation of Joyce's conservatism this season. Then, signing Maclaren and Shayon Harrison in the January transfer window effectively confirmed the Uruguayan's exit. In his first season, Fornaroli feasted as the reference point for Harry Novillo and Aaron Mooy, scoring 28 goals in 32 competitive appearances. Tim Cahill's introduction cramped him of the pockets of space he thrived in, where he could wriggle clear of defensive attention and create separation to pass or shoot. Despite returning from a broken ankle to score five in the last six games of the regular season last term, the initial burst Fornaroli had upon arrival was missing. Joyce persisting to not select Fornaroli was rational with his tactical plan in context. The 31-year-old visibly lacked the physical capacity to maintain the required energy to play as City's striker, focusing on reactive phases of play. Energy and effort are important, granted, but for Joyce it appears to be everything, along with an intent to avert ever-present risk. It would explain why off-season signings in Wales (1,688) and Kearyn Baccus (1,681) have seen the most minutes out of anyone forward of the defensive third in the Melbourne City squad this term. Baccus' prominence is particularly reflective, in the face of his almost comedic misinterpretation of attacking role in central midfield. Weighing this all up, that reflection from Joyce on Saturday's performance was important. As the game went on, City's energy and ability to recover the ball nullified Victory's ability to transition quickly with numbers. Yet, that energy didn't facilitate fluctuations in tempo and certainly didn't aid in breaking down a 10-man Victory defence. With 68 percent possession in the second half, the three shots inside the Victory penalty area all came from crosses and subsequent spills. In the 24 minutes between Rostyn Griffiths' and Dario Vidosic's attempts from inside the area, City looked devoid of ideas and courage from a positional standpoint. Even with Maclaren leading the line, it doesn't change the fact City are only really effective in the transitional phase of attack, as long as errors like Georg Niedermeier's on Saturday do not gift them openings. After the match, much was made of Brattan and Griffiths shots that hit the frame of the goal. Despite the difference in scoreline, there was a very similar pattern of play to City's 2-1 win over a 10-man Newcastle in January. The only difference that day, Brattan's deflected attempt from distance finds the net. The Jets remained compact in the second half, and almost snatched a draw following Ronald Vargas' early dismissal. Ultimately, Melbourne City under Joyce are living, breathing evidence that mere possession in the opposition half does not equal control. The very reasons that have made City one of the A-League's stingier defences this season have also made them one of the A-League's more predictable attacks. Positively for Joyce, there was no lack of energy and application on Saturday, which is relevant given the circumstances that led to Fornaroli's departure and the reported precariousness of his own position. Evidently, the modus operandi is work harder and faster. If one works smarter with the ball, though, that's just a bonus.